Promote engineering opportunities through job vacancies, apprenticeships and college courses. “I am so glad to have been given the opportunity to organise this event. Raising awareness of the industry and showcasing some of the fantastic things we are doing to make a difference to our future is something to be proud of” commented Amy. Sponsored by both the Institute of Civil Engineers and JBA Trust, the event will be supported by many organisations who are exhibiting including; JBA Bentley, Anglian Water, Great Grounds, Environment Agency and University Centre Peterborough. Amy and Linda have been awarded QUEST scholarships which are a sign of excellence in the industry. The scholarship is for students on further or higher education courses that could lead to becoming an ICE technician member (MICE) and recognises people for their abilities and potential. It also provides financial support of up to £1,500 which can cover additional costs involved in undertaking a college course – such as buying a new computer or covering the costs of materials required. As part of this scholarship Amy and Linda needed to undertake a task that promoted the ICE, the scholarship or Civil Engineering. 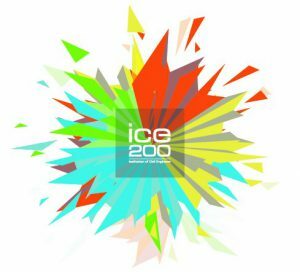 Through discussion, both engineers decided they wanted to do something special for this award due to the ICE celebrating their 200-year anniversary this year. It was then decided that they wanted to reach out to the public to raise awareness of some of the great things they both do in their roles and to promote these as a career in engineering to others. “I think it’s important to highlight both women in the industry and the diverse job roles available within to try and change people’s perceptions with the aim of showcasing innovation” added Linda. JBA Trust work in partnership and develop relationships with universities, schools and other charities to provide support for a wide range of people and organisations. We highlight the fantastic opportunities of studying Science, Technology, Engineering and Maths (STEM) subjects and the many interesting and varied careers that STEM can lead to. 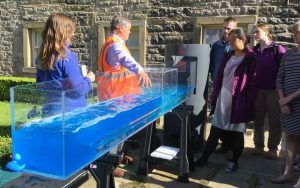 Our large hydraulic flume will be in action throughout the ‘Engineering for the Future’ event demonstrating how different engineering structures interact with the flow of water in a watercourse, and what can happen in flood conditions. By demonstrating interactive and engaging physical models, we hope to spark an interest in people who have not previously thought about a career in engineering. Email Amy Finbow or Linda Mcintosh for more information on the event. You can also visit our physical model webpages or contact us for more information about our work. « MSc student bursaries – apply now!